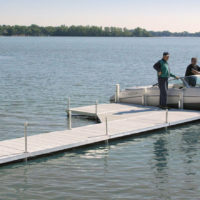 Hewitt Vers-A-Dock sectional dock systems offer many advantages over traditional post and plank docks. Modular components simplify setup, changes and removal. 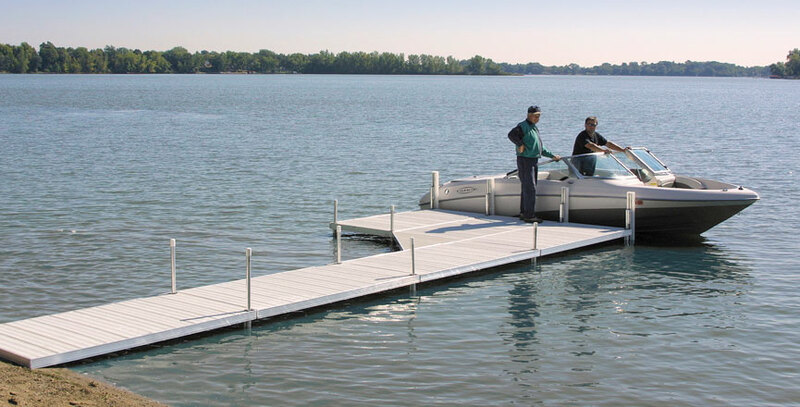 With smaller, lightweight frames and 4’ x 4’ drop-in deck sections, one person can easily assemble an entire dock. A 4’ x 8’ frame section weighs just 38 lbs (54 lbs with two poles attached), and deck sections are only 36 lbs each. Vers-A-Dock also features inside post mounts for a smooth side wall with no protruding parts that could damage boats. Vers-A-Docks require little or no maintenance.